This can't be too hard, can it? It’s been eight weeks since I gave birth to my son. Those eight weeks were preceded by 10 months of pregnancy, during which I ate pounds and pounds of ice cream and considered walking to the cafeteria my daily exercise. As my delivery date neared, I started working from home exclusively and was so sedentary my sister worried I’d develop blood clots in my legs. My coping strategy for getting through the end of pregnancy involved moving everything I needed — laptop, phone, TV remote, several of my husbands oversized t-shirts, bag of jumbo marshmallows — into bed with me and getting up only to pee. If you know me, you’re aware I’m not a terribly athletic person. I was in Coke-bottle glasses by age seven. I was the kid who had to be thrown into the pool for morning swim team practice. I was 10 before I mastered a bike. I was a reader, a drawer and a daydreamer. My idea of a fun, competitive activity is lobbing a tennis ball over the net without serving or keeping score. I knew what that really meant: he wanted to find out if I carried the necessary amount of athletic genes to produce a champion football player. While I’m certain I never passed these tests, as I surely fumbled every pass thrown at me, my husband decided to marry me anyway — poor vision and “let’s all get along” attitude be damned. So, now that I’m faced with the challenge of getting back in shape, I’m not exactly brimming with confidence. This just isn’t my area of expertise. That did not happen. Instead, I got a breezy, “Looks good!” and a stack of brochures about contraception. What??!! Does this mean my 10 months and six weeks of special treatment, of having the perfect excuse for total laziness, are over??? After spending the past two weeks in denial, it’s finally time to face facts. Truthfully, I’m tired of wearing the same pair of yoga pants (yoga — ha!). It’s time I got reacquainted with my wardrobe, which I’ve been pointedly ignoring up until now. The only place that’s more of a “factory of sadness” than Cleveland Browns Stadium is my closet. I’m ready to get in shape. I think. 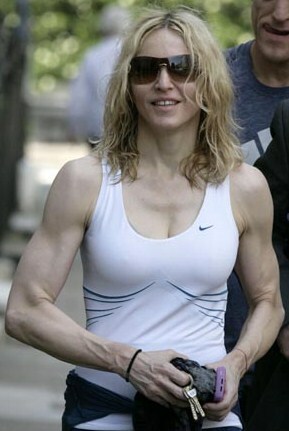 The last time I felt this motivated, I told my sister (who was working as a personal trainer at the time) to put together a workout plan that would make me “look like Madonna.” After seeing what it would take to look like Madonna, I decided looking like myself wasn’t so bad after all. But will I ever again look like myself? Veteran moms, please tell me: has my formerly stick-straight shape permanently changed? I’m okay with having a few more curves than I used to, since my former body shape resembled that of a 12-year-old boy. I just want to know what’s ahead. And, if you have any tips for getting into shape, please feel free to share those too. Especially if they involve lobbing a tennis ball over a net, reading a book or eating marshmallows in bed. Posted in Children, Health, Life, Pregnancy and tagged getting in shape after pregnancy, losing baby weight, weight loss. Bookmark the permalink. This is awesome! I was the opposite during pregnancy and found it enormously difficult to not be in control of my body so was training up until 33 weeks! Saying that, afterward it took longer than I thought before I could resume regular activities. I’m afraid that none of them incorporate slow tennis matches instead they involve a lot of movement and a serious lack of marshmallows. GOOD LUCK! 9 months on…9 months off…best advice I ever heard. Don’t be too hard on yourself. Let it happen gradually. And you really do hit a point where all of a sudden your body seems normal again.